Overall, I'd say we've had good success diving into the world of frozen yogurt in our house. My wife is a a much bigger fan than I am, but I have been swayed to the opinion that you can make quality treats with frozen yogurt. Well, I was at Walmart and what do i see but little frozen treat snack cups from Kemps. I think they had more choices last time I was there, but this week they only had the Trail Mix flavor: vanilla frozen yogurt with granola, nuts, and mini chocolate chips on top. The first thing you notice is that the yogurt is VERY white, it's disturbing actually. I mean, i guess plain yogurt is white, but this is unsettling. I mean, when's the last time you had something that was both tasty and colorless? Well, you don't know for sure until you try it. I scooped out a spoonful of just yogurt. For a brief moment, you are hit with a citrus-y type taste ...and then it REALLY hits you ...this AWFUL, hideous, disgusting spoiled milk type taste. I spit it out into the sink and rinsed with water. No, that's can't be right. I tried again ...and spit again! I have to write to Kemp's and see if maybe this went bad because there's no way they ship a product this awful. UPDATE: This was not a fluke. I just tried a different flavor from a local Stop & Shop and it had that weird spoiled taste to it. I've been eating KEMPS Frozen Yogurt Parfait's for about the last 6 month now and I think they are awesome. They only flavor I do not like ironically is the Trail Mix one as it has a funny plain yogurt taste to it. My favorites are Mango Peach and Mixed Berry. These little single servings pack less than 200 calories each and they taste great. Sorry you had a poor experience. I love these because they are low calorie, low fat, taste great and are usually 10 for 10 dollars at the market. All yogurt really is, is spoiled milk by bacteria. In a controlled enviroment its processed to propperly become a healthy snack. People usually hate it or love it and for some that spoiled milk flavor really stands out. 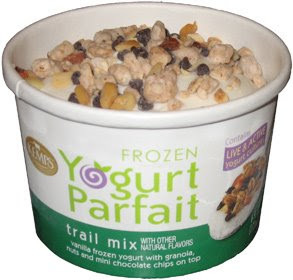 However I love Kemp Parfait's, I havent had the trail mix but the mixed berry and rassberry whit chocolate are my favorites. I love them more than ice cream, but I have an aquired taste for homemade, healthy, and organic foods. I hate processed food or food derived of too much artificial flavors.